Ugggh, January - enough already! Ok, so I'm ready for Feb. New month, hows about some new weather please? Warding off the end of Jan blues with a shopping spree for new bolts of fabric to make some special quilts with. Yummy - def the best tonic in my opinion. Can i get a prescription for it though? I'm having so much fun working on this project. I don't really want it to end! A Whole Lot of Log Cabins Being Built! I had such a lovely morning today teaching my Log Cabin Workshop. This class really feels alive with so many ideas. These are the class samples I've been working on. This week we were mastering the basic technique of the log cabin (Do you build clockwise? anticlockwise? How do you remember where to start building from when you pick it up again after a break?). We talked lots about different layouts, playing with scale, how crucial colour is. I'm so lucky to have such fun students, open minded about trying something new. Their own log cabin quilts starting to take shape - lots of decisions about colour and style. My favourite way to spend a morning! I have been busy making samples for my up coming Fabric Baskets class ( March 14th 10am-1pm at St Annes in the daytime and March 25th 7.30-10pm at Buckland Village Hall in the evening). It's been a bit of a fabric basket factory at my house for the last few weeks working through my pattern and trying out a whole lot of different interfacing to make my baskets the right combination of bendy but rigid. I'm picky. I have the perfect consistency in mind but finding the right product to achieve it has been an adventure, I now own a lot of different interfacing. The upside being that I now also have a lot of different fabric baskets, from firm to floppy and all in between! Interfacing is one of those areas that baffles lots of people - and its not surprising why. It's strangely labelled, the different brands don't use the same language to describe their products, its just not consumer friendly. The good news is that I think I've found the perfect consistency in a product that's also easy to work with. 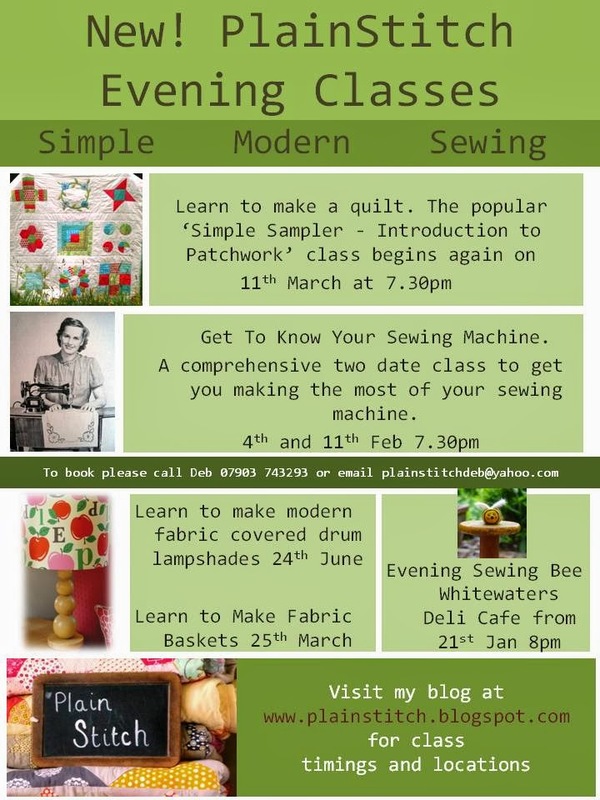 I'm excited about this class, it's my favourite combination of a really practical sewing project, but at the same time it's a fab fun use of some of those long horded fabrics in your stash. Use them to store fabric for different projects in progress. Plus it's the perfect home for those fabric piles that are still 'in development'! I love to just play with fabric colours and make little piles of loveliness that may or may not make it into a finished quilt. Humm, is it possible I still don't have enough baskets for all of these planned uses? I think I may have to run up a few more of these before school pickup time! 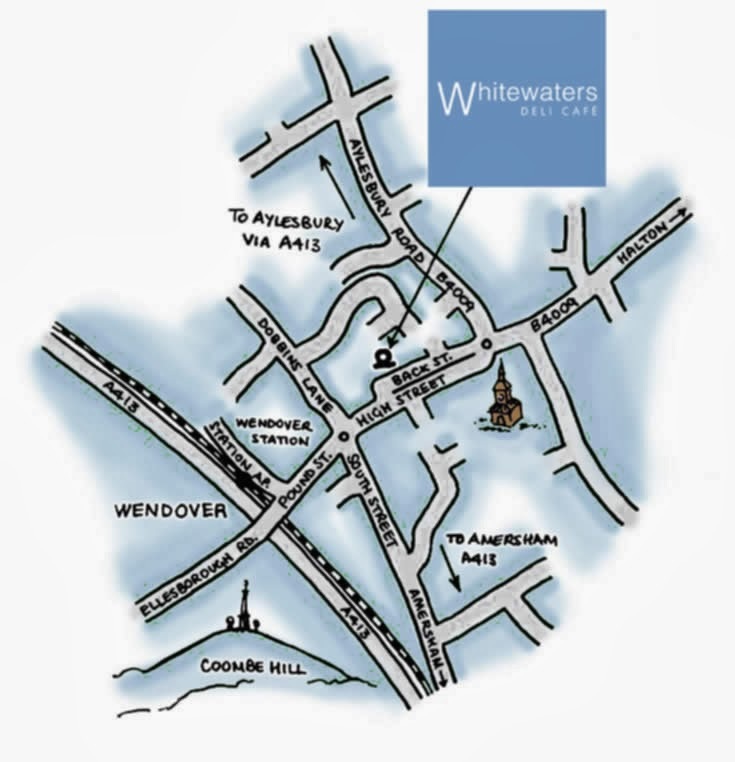 We had such a great evening at the lovely atmospheric Whitewaters Deli Café last night for our first evening Sewing Bee. Every seat taken! Lots of exciting projects, twinkly lights, new faces and old, lots of tea and chat. It was fabulous. Thank you to everyone who came along and hope to see you again next month! OK, so don't judge me. I spent a very enjoyable morning at my Get To Know Your Sewing Machine class this morning. We got lots of machines whirring and it was all lots of fun. So to relax and switch off what could be better than an afternoon gluing the needle felted eyes onto my daughters pompom people? Do you own a pompom maker? You'll only judge me until you get yourself one and have a go. It's proper horrid outside today, so this final finish in my Log Cabin series for my class next week will have to get it's Ta Dah moment in the same pose as last weeks finish! Miff the cat definitely has the right idea, curled up in a warm armchair. Hope you can do the same. The print in the middle of these squares is a Heather Ross print on a heavier linen background. I loved the picture, but struggled with what to do with peaches and browns for a while. This scrappy picture frames quilt uses up lots of strip scraps I had, left over bindings and such. I used scraps, but with a tight colour rule of grey, brown, yellow orange or red. It's a fun block to put together and a great way of using up bits and bobs of fabric if you're planning a fabric shelf spring clean! Just cut up any scraps into 2.5inch strips ( which is my chosen binding width so it makes your scraps multi useful) and keep them together in a box, and you'll always have the right scraps to reach for! January is a super exciting month for me as it signals the start of a new year of classes and it means that I get to teach classes for the first time that I have been developing for sometimes up to a year. I had the plan for my Log Cabin Workshop back in the spring last year. I started making example quilts then, had a complete Log Cabin Immersion for a month or two over the summer and have been slowly quilting my way through the samples over the winter. This quilt was a real favourite to piece, and I had some help with the quilting ( It was one of my sample quilts that went to the long arm quilters!) and so it was even less of a chore to finish it off with a lovely sophisticated grey binding this weekend. Doesn't it make you feel springy and hopeful? Just one more log cabin quilt to be bound and I'm ready to loose myself in log cabin world again in 2 weeks time for the start of my class. Every time you open a newspaper or turn on the radio at the moment all people want to talk about is how depressing this first week back to real life is after Christmas, and this year with rain and floods and snow and goodness knows what next, it could be more depressing than ever, no? I often tell people that patchwork keeps me sane. Often they've just told me how cutting fabric up into tiny pieces, just to sew back together again is surely the first sign of madness?! I find having a creative outlet - mine is sewing - but it's true of all creative activities, is absolutely the best way to ward off 'Blue Mondays' or any other day of the week. Having a 'project' on the go, separate from your 'real life' of deadlines and dishwashers allows your brain to recharge, fills you with optimism ( every project feels like 'the one' when you start it) and lets your brain rest in the now. I have a psychologist friend who often recommends 'mindfulness' as a great brain exercise - letting your brain immerse itself in something now, this minute, more absorbing than the TV, not allowing space for reflection or worry about the past or future. Patchwork definitely fulfils all of these criteria, not even allowing for it's wonderful capacity to make you lots of friends, another critical thing in warding off blues! If patchwork is the panacea to all ills - the Farmers Wife Sampler must be at the pinnacle! Is there anything more cheerful than the feeling you get when you finish a few of these blocks? If you've got the January Blues, I heartily recommend you give them a try! I'm really pleased to finally be able to announce that for those of you who work, or have little peeps to juggle during the day, we now have a whole raft of classes available in the evenings at our new venue the charming Buckland Village Hall ( just outside of Aston Clinton) as well as a weekend Retreat Day in Feb ( more details to follow). A lovely relaxing full day escape from the real world - The PlainStitch Retreat Day on Feb 8th. If you already have too much fabric for a shopping bag to hold you'll need our very practical Fabric Baskets Class in March to store that stash, a one off session. And why not use up some of that stash at our Fabric Covered Lampshades Class in June? I really look forward to meeting some of the lovely people who have been so politely and patiently asking about evenings over the last couple of years! Happy New Year, Happy New Sewing Project! Now I know that many people are fighting floods here in the UK or snowstorms in the States which really doesn't make for a very happy New Year. Finally, here in my little corner of English Countryside, after a morning of biblical torrents, the sun came out for all of 20 minutes. Wow. Sunshine. Spring. Joy. 20mins was all I needed to spring into action and start pulling fabric for a fun new project I have planned for a PlainStitch Sewalong Class in the Spring next year perhaps. It's full of zingy fresh spring colours and I can't wait to get making this quilt! It seems that a new pile of fabric and sunbeams bouncing through a cut glass bowl is all it takes to make me happy. Simple things!